That rain thing. In Texas it falls into four categories: wishful thinking, mosquito -breeding droplets, nourishing saturation, or downright destruction. Last spring’s rains fostered lots of bacterial disease, like fire blight on George Byrnes’cotoneasters in Adkins. “When it rains in spring, spores get bounced from stems and branches onto flowers and new growth, infecting the tissue and starting the process over again. Fire blight is cyclical, with alternate plant hosts, so it may not even be a problem most years.” Find out more and what to do about fire blight. Zinnias and gomphrena are gorgeous summer companions which butterflies love as much as we do. Try to avoid overhead watering that washes out nectar. At Lake Austin Spa, Trisha seeds from April to October. You can also get a wide array of transplants but seeds give you more options for sizes and forms. ‘Cut and Come Again’ and ‘Benary’s Giant Mix’ can grow up to 4’ tall for long-stemmed arrangements. Trisha tells us: “One of the biggest problems is powdery mildew—a white powdery coating on the leaves that can kill the plants, often caused by high humidity and cool nights. Good air circulation, careful spacing, and avoiding water on the leaves will keep them healthy. Look for new zinnia varieties that have improved mildew resistance.” Find out more. Our Plant of the Week is David Austin rose, Abraham Darby. Kristen Rosin won hers in our online contest last winter and she’s loving it! Daphne grows this fragrant shrub rose that wants sun, like all roses, but protection from late afternoon sun. Since it is a shrub, she corralled it with this charming obelisk she crafted from three metal trellises. The “feet” are pointed to insert in the ground. Daphne reports that it’s as sturdy as it is elegant! Viewer pictures this week feature butterflies. Kyla Rodgers discovered a newly emerged Gulf Fritillary on her red yucca. Soon after, it flew off to get its first meal in her lovely garden. And Kerstin Chapman has been raising Monarchs at home and in her classroom. This one was Monarch #42 raised in her butterfly cage at home. Here’s another on native Gregg’s mistflower. With many native wildflowers in her backyard, in May, Kerstin discovered many leaves with eggs and early instars of Monarch larvae. Recent rains have us all scurrying to make fall planting lists. Right on time, Barbara Wright from Wright’s Nursery in Briggs (Burnet County) inspires with top shelf native plants! If you love tropical mimosa trees, try drought-tolerant native fragrant mimosa (Mimosa borealis) instead. This deciduous, deer resistant shrub/small tree for rocky soil gets around 4 – 6’ tall, sporting fragrant pink puffs in spring. For shade, I’ve included native Coralberry (Symphoricarpos orbiculatus) in dry spots that get little sunlight, though this picture is not from my garden! Deciduous in winter, its coral/purple berries grab attention from birds and small mammals. Deer resistant, it grows to about 16”. An evergreen that I truly love in my garden is Texas bluegrass (Poa arachnifera), perfect for shady spots that get some sun, too. You can mow it, but I don’t, since it’s a no-care shade bed filler for me. Its showy spring flowers nicely complement blooming wildflowers. Also in part shade, Manfreda maculosa (and other Manfredas and Mangaves) structure up with succulent softness. Some sunlight does heighten its purplish leaf spots. Perennial Texas greeneyes (Berlanderiera betonicifolia) attracts pollinators and repels deer in part shade with moist soil. We couldn’t get to all the plants Barbara brought, like Simpson’s rosinweed, so check out her list for more details on all these great plants! In case you missed it, here’s our segment when Barbara and husband Bobby tuned us into more drought-tough wildlife lovers. Paloverde Desert Museum (Parkinsonia x ‘Desert Museum’) blooms all summer and into fall, extending this retama’s pollinator nectar feast. When ecological land designer Elizabeth McGreevy helped Havilah and Ryan Gee turn their lifeless front yard into liveliness, they chose it for its stunning green bark and lacy foliage, too. 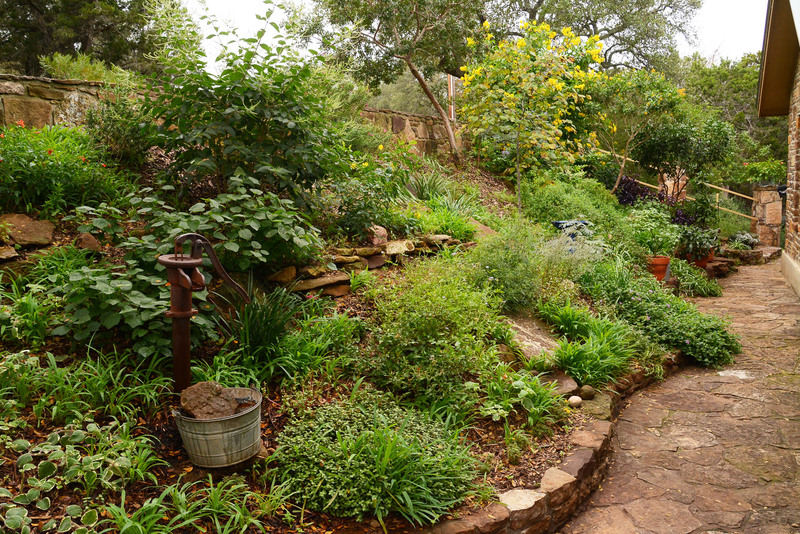 The Gees wanted a low-care, low-water garden where they can also grow vegetables and herbs. Elizabeth also translated their vision with contemporary, geometric dimension on a rectangular lot. Here’s Mexican feather grass, herbs and agaves stretch across raised beds bordered by bamboo muhly. ¼ minus limestone underlaid with road base packs down to fend off weeds and provide sturdy ground for the front yard patio and curving walkway. Curbs slow down rainfall to encourage a slow soaking in. ← Wicking beds, sun scald, tomato tasting!